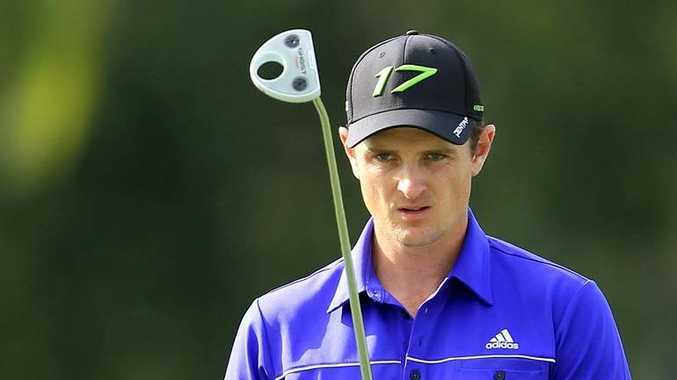 ENGLISHMAN Justin Rose has survived the toughest test in golf, winning the US Open at Merion by two shots from Phil Mickelson and Jason Day. Rose shot an even-par final round 70 to finish at one-over par, the third time in the past four years that no player had finished under par. The victory came 15 years after he burst onto the scene as a 17-year-old at the British Open at Royal Birkdale, finishing tied for fourth behind Mark O'Meara, and winning the amateur trophy by 10 shots from Sergio Garcia. Rose turned professional the following day, but missed the cut in his next 21 starts. Yesterday he finally came of age, pointing to the heavens after making par on 18, a nod to his late father Ken who passed away from leukemia in September, 2002. Mickelson received no such divine intervention, a disappointing round of 74 highlighted by a miraculous eagle from almost 70m on the par-four 10th which kept him in contention. It was the sixth time he had finished runner-up in the US Open. Day again showed he was at home on the sport's biggest stages, his challenge brought undone by a bogey on the 17th and a par on 18 after his short putt lipped out.